This was the story my psychologist told me in college. My feelings of sadness, anger and fear would never go away, I would just get better at managing them with the right tools. Tools she would teach me. When I heard this, I was completely depressed. I would never get over these feelings? I had to learn to “manage” them. This just seemed so unfair to me, such a burden. I just wanted to be happy. To feel positive emotions, instead of sadness, anger, and fear. But I took her advice, I learned her tools and I fumbled my way through life for a while. To be honest, it didn’t go very well. At first, everything was ok, but as I matured and participated in life’s events; career, friends, relationships, marriage, I, again, noticed I wasn’t happy. And I was no longer managing my sadness very well. Then I found a healer, using intuitive energy healing, that changed my life. I am no longer the same person I was before I worked with her. Her method of healing was to work with the meridian system in the body (the foundation of Chinese medicine) to clear stuck energy. Energy gets stuck in these channels in our body due to traumatic events in our lives and, well not so traumatic events too, that leave a distinct impact on us. 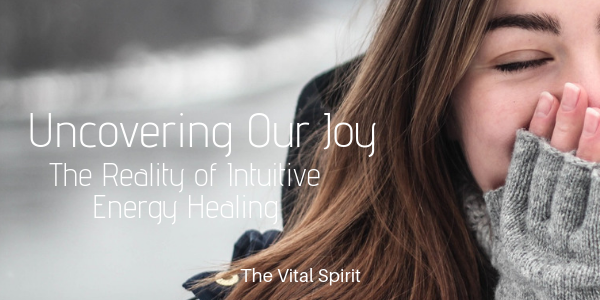 Intuitive energy healing can clear these energy patterns and then we are released of their control on our experience of life. An example might be, someone experienced abandonment by a person they loved and trusted early in their life. In response, this individual created some limiting beliefs (I am not worthy of love, People always leave me) and several patterns of behavior to protect themselves from the pain of future abandonment, such as a fear or lack of commitment, a shallowness of feeling, a proclivity to move to new places and so on. Once the stuck energy (wound of abandonment) is cleared using simple and quick techniques, we then begin to shift the resulting belief(s) and patterns of behavior that were created to protect us from re-injuring that wound. And this is where the magic comes in because once the wound, beliefs, and patterns are clear, we are free of their effects. It is a palpable feeling of relief. A person may now have the ability to choose a response and not react out of a program they feel no control over. An individual who transforms the wound of abandonment can then feel the desire to commit, begin a deep and abiding relationship, buy a home, and/or develop a career. The memories of the event remain, but the trigger or negative emotional charge on those events is either eliminated or reduced to a manageable level. For instance, she might feel sad when remembering that her father left the family but that sadness is not in her awareness all the time, just when her mind thinks of the event. When she meets a nice man who shows interest in her, she doesn’t turn the other way out of habit or fear, she may get to know him and feel that dating or relationships are something she can have for once. Uncovering and healing our hidden wounds is very profound. Intuitive energy healing gives us the opportunity to live a life free of our baggage for the first time. It is liberating and transformative. This is what happened to me and I am pleased to have taken the time over that last 10 years to learn how to provide other people the opportunity to live a life free from emotional baggage. Disclaimer: We are, each of us, our own healer. Intuitive energy healing techniques can only assist in helping you heal what you are ready to acknowledge and release. All healing is a partnership between the healer and the client to bring you into alignment with your authentic self. To learn more about my work go to Quantum Alignment Session Info.